Before email, before fax, there was a way of sending written messages reliably and securely between distant offices. It was called Telex. It worked much like the telephone, there were numbers and exchanges (central offices), and you called whoever you wanted, anywhere in the world, to send them a message. Instead of a telephone, you had a teleprinter. As you typed, your message would appear by magic on the distant machine also. You could even hold a conversation, taking it in turn to type messages to each other on the same connection. The Telex network was at the heart of banking, shipping, trucking, insurance and many other industries. The teleprinter was independently invented by several organisations in the early 1920s. Originally they were connected together in pairs, one at head office and one in a branch. The limitations of this are obvious, and a switched network allowing anyone to talk to anyone else was an obvious next step. The first public Telex network in the world opened in Germany in 1933. It really prospered in the 1950s. Only recently, with first fax, then various computer network technologies, has it been eclipsed. The UK network closed in 2008. When I was 16, like all students I wanted to earn some money during the school holidays. I could type well, thanks to the typewriters my mother had at home when I was small. 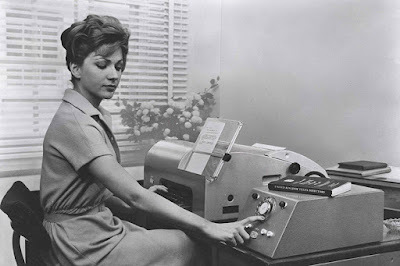 One summer I worked as a typist, but my mother's advice was that there was more money to be made as a Telex operator. Back then this was considered a special skill - a company wouldn't expect a normal typist or secretary to be capable of it. Telephonists were just the same, even a small office would have a dedicated telephone operator at the company switchboard. When I started work at DEC in 1974, we had three of them for an office of maybe 200 people. There were agencies that specialised in this kind of staff. I chose one called "Three T's" - for telephone, telex and... no idea, probably not telegraph though. I got in touch with them, and went along for an interview. My mother's office had a Telex - though no operator since my mother took care of it herself. Even the boss knew how to work the machine there. It would have been smart to have spent a couple of hours using it before I went for the interview. But I didn't. So when they sat me down in front of their brand new Post Office Model 15 Telex machine, it was quite literally the first time I'd ever set eyes on one. This wasn't really very smart, but using my mother's description of how it worked I was able to figure it out in real time sitting in front of the machine. I even got complimented on how well I knew the machine! So that was it, my career as a telex operator was launched. The next day I was working at one of the big investment banks somewhere in the City. They were a real heavy duty Telex user, with a bank of half a dozen machines, and operators to match. 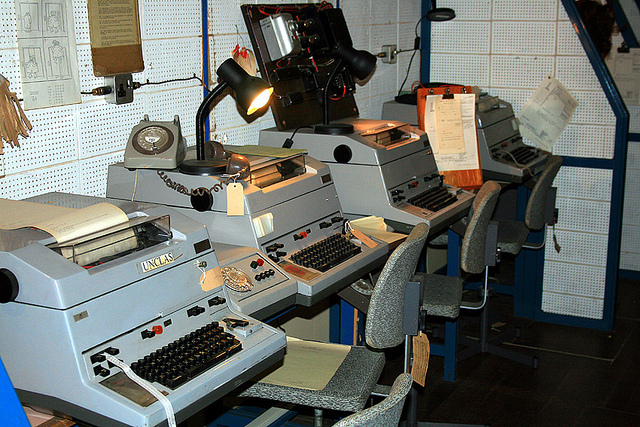 Some of the machines were used for live traffic, while others were used to prepare and verify messages on paper tape. Each message was a financial transaction, sometimes involving truly vast amounts of money, so a lot of attention was paid to getting it right. All of the permanent staff were female. This was nearly always the case, though occasionally I'd come across an ex-military guy especially in the banks. A lot of the ladies had been trained during World War II, so by now were of a certain age. At one place I overheard two of them grumbling about the new generation of machines: "Oh, they're trying to make it so any old typist can use a Telex, well we know that's not possible, it needs special training, that's what it needs." And so on and so on. The WWII era machines did require a bit of special understanding. There were still quite a few of them around in 1969, though they were disappearing. They were originally designed in 1931. They had a hammer green enamel finish and a very stark external design, with no concession to aesthetics. Under the cover was a massive electric motor and equally substantial mechanical parts, whose job was to convert faint electrical pulses into the position of a typewheel. Keystrokes were converted to the Baudot Code for transmission. This has only five bits per character. By the time necessary control characters like line-feed are included, there are only 26 possible characters - not entirely coincidentally, the number of letters in the alphabet. To include numerals and punctuation required shift characters. If you pressed the key marked with W and 2, what actually got printed (both locally and remotely) depended on whether you had last pressed the letter-shift or figure-shift key. The operator had to remember this. She (usually) also had to pace the typing speed exactly to the mechanics of the machine. If you tried to type too fast, letters went missing. But if you went too slowly, you wasted time and on the Telex network, time was very much money. 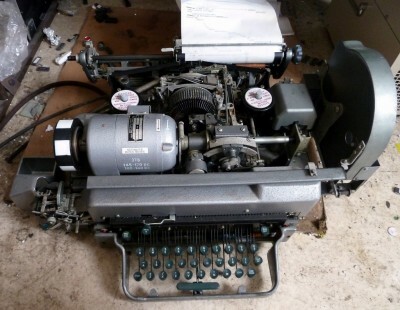 There was another version of the same machine that had a paper tape reader and punch, so you could prepare your message without connecting, check it for accuracy, and then send it at the full speed of the network (about 7 characters/second). The newer machines, called the Model 15, were much more modern, with a smooth grey finish and black plastic keys. They all had paper tape readers and punches. They had a four-row keyboard, like a typewriter. You still had to select letter or figure shift, as appropriate, but the inapplicable keys were physically blocked, so you wouldn't end up sending gibberish. I'm not sure that a regular typist could use one without a bit of training, but they were a lot less daunting than the old green ones. Both types had a separate box for managing the connection to the Telex network. This had a dial, and several buttons to do the equivalent of picking up the phone and hanging up. It was a good size, well over a foot long and weighing about 15 kilos. Inside it was packed with relays and other signalling equipment. One of the great advantages of Telex was security. When you made a connection, you could send a special code called "who are you" (or WRU) which triggered a mechanism in the remote machine to send a unique preconfigured response, called the "answerback". You could also send your own, by pressing a key marked "here is". Once you'd been through this exchange, each end knew with certainty who it was talking to. Hence Telex could be safely used for large financial transactions and other expensive commitments like sending a giant container ship to the other side of the world. At least, that's what everyone believed. The truth is, if you knew what you were doing, it wasn't secure at all. It was very easy to defeat the answerback mechanism. On the Model 7, all you needed was a pencil. When the machine received the WRU signal, the Here-Is key, perched awkwardly above the keyboard, dropped down to start sending the signal. If you wedged a pencil under it, you were then free to type whatever you wanted. On the Model 15 it took a little more mechanical ingenuity, but it could certainly be done, a very tiny adjustment inside the cover which could as quickly be restored. Whether anyone took advantage of this to commit fraud, I have no idea (honest). How did I know about this? Whereas the banks ran their Telex machines flat out, there were several places I worked where there was hardly any traffic. One in particular was a timber merchant somewhere in East London, maybe Hackney. I doubt that there were even half a dozen messages a day. No doubt for security, the machine and its operator were in a closed, windowless office. There was plenty of time for a mechanically curious youngster, fascinated by how these machines worked, to investigate. It was at this place that I stripped a Model 7 down to its component assemblies, discovering all its inner secrets. I'm sure this was a serious infringement of the Post Office regulations, but if anyone had asked I would have said it had jammed and I just happened to know how to unjam it. Nobody would have been any the wiser. Luckily no messages tried to come in while I had the machine in pieces. Some banks had their own dedicated international circuits. I worked at one that had its own dedicated circuit to New York, which must have cost a fortune. But to save money, it had some electromechanical trickery that meant it ran at a quarter of the normal speed. The Post Office sold the other three quarters of the circuit to other customers. It was odd to watch it ticking away in slow motion. What was really impressive though was one of the operators - unusually, a man - who could type at exactly the right speed, just less than two characters per second, to match the line speed. This being the 1960s, he did it with a lit cigarette hanging out of the corner of his mouth. I did the Telex gig for a couple of summers, as well as some of the shorter holidays. I never told the agency that the first time I ever saw a Telex machine was when I walked into their office. But it didn't seem to matter, because for years afterwards, long after I had my degree and was working as a software engineer for far more money than 3Ts could ever hope to pay, they would get in touch with me every summer and ask whether by any chance I was free to go and replace a holidaying Telex operator.